I was tempted to write this review with just one word. That word is ‘beautiful’. Written by Nick Cave at exactly the same time as Murder Ballads, these songs were written with simplicity in mind, and as such the majority of these superior compositions feature a stripped back Bad Seeds, and a heavy dose of piano. The contrast with Murder Ballads could not be greater, taking a deeply intimate, romantic and often spiritual tone. No one dies here, one may be relieved to know. But maybe a little part of Nick Cave died in order to make a collection of songs; that part of him would be the preacher, the aggressor, the dervish spirit howling and caterwauling over a maelstrom of sensational music. It genuinely isn’t a criticism – I happen to think that this is among Cave’s finest work. 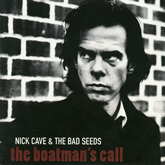 Everything about The Boatman’s Call is black and white – the Johnny Cash-esque Anton Cobijn photo of a particularly harrowed Nick Cave on the front cover, through the predominance of the piano keys across the LP, through to the downright clarity of Cave’s songwriting. What’s most clear about The Boatman’s Call is the often obvious theme of these songs, for this is Nick Cave’s most directly personal collection of songs, from the post-PJ Harvey reflectiveness of the quirky folk leanings of ‘West Country Girl’ and ‘Black Hair’, through to his ruminations on his failed marriage on ‘People Just Ain’t No Good’ or ‘Where Do We Go Now But Nowhere’. However, aside from a fair amount of openness from our tortured songsmith, The Boatman’s Call also features two generally beautiful love songs – ‘Lime Tree Arbour’ and ‘Brompton Oratory’. Like much of the album, these have a musical accompaniment from The Bad Seeds that is directly informed by subtle jazz but the latter also features a perfectly twee Casio rhythm that sounds like it survived from Cave’s original demo. The latter describes a trip made by Cave to Kensington’s famous, and imposing, landmark, and finds Cave wishing he were one of the stone apostles therein, just so that he wouldn’t have to deal with his muse’s intense beauty. It perfectly captures the intensity of romance’s first flourishes, that feeling of not being able to cope anymore. ‘Lime Tree Arbour’ is just mystical and beautiful, its waterside setting making me think of Murder Ballads‘ ‘Where The Wild Roses Grow’, with all the same romantic longings, just none of the death; an alternative ending, perhaps? The album features the full Bad Seeds line-up (Mick Harvey, Blixa Bargeld, Thomas Wydler, the late Conway Savage, Martyn P. Casey, Jim Sclavunos and Warren Ellis), albeit in controlled doses, and benefits from an unusually restrained production job from Flood, who also produced the oft-slated U2 album Pop the same year. The style of production is subtle and delicate, and Cave’s vocal is dominant in the mix, casting a personal, intimate shadow over proceedings. It feels like a one-to-one connection between the narrator and sympathetic listener. Warren Ellis’ violin is also an important element here, receiving greater space in the mix than it had been given previously, bestowing the gypsy folk of ‘West Country Girl’ with a rabidly maudlin edge. His work on ‘Idiot Prayer’, perhaps the track closest to a classic Bad Seeds ballad sees his violin overtaking Blix’s fuzzy guitar as lead instrument, a sign of the sea change that was to come. I have my own, highly personal reasons, for counting this among my favourite albums of all time. Suffice it to say, many years on, it’s the more miserable tracks here – like ‘Far From Me’ – that I find myself reflecting on when I think of that period in my life. ‘Can’t you find somebody else / That you can ring and tell?’, Cave sings on that penultimate, delicately poignant song. Wise words that I wish my younger self had heeded. First published 2004; edited 2018. 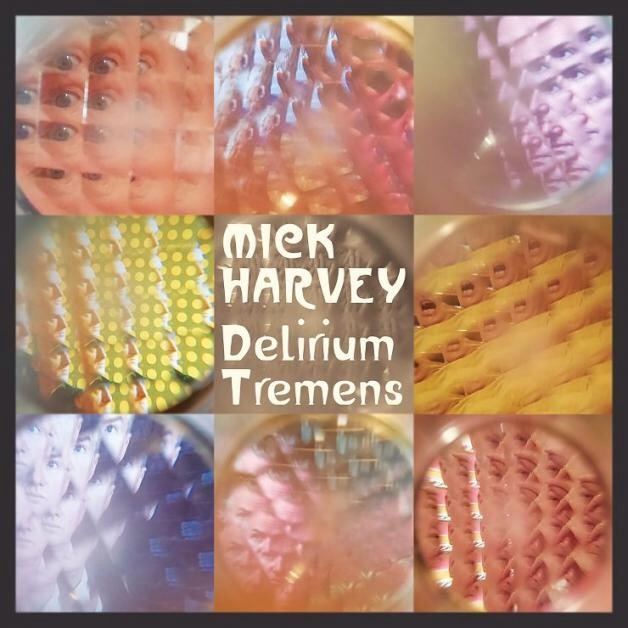 I reviewed the third instalment of Mute stalwart Mick Harvey‘s project to translate the songs of Serge Gainsbourg from their native French to English, Delirium Tremens, which was released back in June. Since this finally got published after a lengthy delay, Mute have announced details on the fourth volume, Intoxicated Woman – not bad going considering the twenty year gap between the second and third chapters. You can read my Clash review here. I was tempted to write this review with just one word. That word is ‘beautiful’. Allegedly written by Nick Cave at exactly the same time as Murder Ballads, these songs were written with simplicity in mind, and as such the majority of these superior compositions feature a stripped back Bad Seeds, and a heavy dose of piano. The contrast with Murder Ballads could not be greater, taking a deeply intimate, romantic and often spiritual tone. No-one dies here, one may be relieved to know. But maybe a little part of Nick Cave died in order to make a collection of songs; that part of him was the preacher, the aggressor, the dervish spirit howling and caterwauling over a maelstrom of sensational music, and that character wouldn’t emerge again until the later Grinderman project. It genuinely isn’t a criticism – I happen to think that The Boatman’s Call is among Cave’s finest work. Everything about album is black and white – the Johnny Cash-esque Anton Cobijn photo of a particularly troubled Nick Cave on the front cover, through the predominance of the piano keys across the LP, through to the downright clarity of Cave’s songwriting. What’s most clear about The Boatman’s Call is the often obvious theme of these songs, for this is Nick Cave’s most directly personal collection of ideas, from the post-PJ Harvey reflectiveness of the quirky folk leanings of ‘West Country Girl’ and ‘Black Hair’, through to his ruminations on his failed marriage on ‘People Just Ain’t No Good’ or ‘Where Do We Go Now But Nowhere’. However, aside from a fair amount of openness from our tortured songsmith, The Boatman’s Call also features two genuinely beautiful love songs – ‘Lime Tree Arbour’ and ‘Brompton Oratory’. Like much of the album, these have a musical accompaniment from The Bad Seeds that is directly informed by subtle jazz but the latter also features a perfectly twee Casio rhythm that sounds like it survived from Cave’s original demo. The latter describes a trip made by Cave to Kensington’s famous, and imposing, landmark, and finds Cave wishing he were one of the stone apostles therein, just so that he wouldn’t have to deal with his muse’s intense beauty. It perfectly captures the intensity of romance’s first flourishes, that feeling of not being able to cope anymore. ‘Lime Tree Arbour’ is just mystical and beautiful, its waterside setting making me think of Murder Ballads’ ‘Where The Wild Roses Grow’, with all the same romantic longings, just none of the death; an alternative ending, perhaps? The album features the full Bad Seeds line-up (Mick Harvey, Blixa Bargeld, Thomas Wydler, Conway Savage, Martyn P. Casey, Jim Sclavunos and Warren Ellis), albeit in controlled doses, and benefits from an unusually restrained production job from Flood, who also produced the oft-slated U2 album Pop the same year. The style of production is subtle and delicate, and Cave’s vocal is dominant in the mix, casting a personal, intimate shadow over proceedings, making this the closest Cave has yet come to the introspection of Leonard Cohen. It feels like a one-to-one connection between the narrator and sympathetic listener. Warren Ellis’ violin is also an important element here, receiving greater space in the mix than previously, bestowing the gypsy folk of ‘West Country Girl’ with a rabidly maudlin edge. His work on ‘Idiot Prayer’, perhaps the track closest to a classic Bad Seeds ballad sees his violin overtaking Blixa’s fuzzy guitar as lead instrument, a sign of the sea change that was to come. I have my own, highly personal reasons, for counting this among my favourite albums of all time. Suffice it to say, seven years on, it’s the more miserable tracks here – like the personally chord-resounding ‘Far From Me’ – that I find myself reflecting on of that period in my life. ‘Can’t you find somebody else / That you can ring and tell?‘, Cave sings on that penultimate, delicately poignant song. Those would become wise words for my younger self. I was minded to re-post this review after hearing the lead single from this album, the delicate ‘Into My Arms’ at the end of Richard Curtis’s About Time movie. It’s been a long time since I heard this album and for the personal reasons alluded to above, it’s one that I now find relatively hard to contemplate listening to. In the movie, Cave’s track is chosen by the dying Bill Nighy as the soundtrack for his own wake, lending the track a greater poignancy than perhaps Cave ever even intended. A couple of years ago someone at Mute sent me a link to a YouTube rip of some songs that were recorded for The Boatman’s Call sessions but which have never surfaced except for on an expensive bootleg CD. The tracks that didn’t make it to the final album were every bit as perfect as the ones that were on the final release, a telling testament to the furious level of output that Cave was enjoying in this period of his life. The twin albums of Murder Ballads and The Boatman’s Call thus stand as one of the most pivotal periods in Cave’s career as a songwriter, marking a crossing place, a transition and the start of his wider public acceptance as one of the finest lyricists of our generation. A6. / 6. Where Do We Go Now But Nowhere? B1. / 7. (Are You) The One That I’ve Been Waiting For? First published 2004; re-edited 2014. This review focusses on the 1997 original release, not the remastered, expanded 2011 edition.